The ESA-Roscosmos ExoMars Trace Gas Orbiter – TGO – spacecraft has found a surprising lack of methane in the martian atmosphere. In fact, the spacecraft’s two spectrometers, NOMAD and ACS, found 10 to 100 times less methane than all previously reported detections by a variety of spacecraft and ground-based telescopes. Martian methane is an area of high interest because it can be a signature of biological activity. 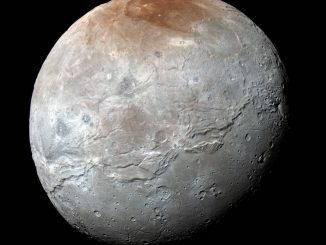 It also can be produced by geological processes, but either way, solar radiation acts to destroy it over relatively short timescales. As a result, any detections indicate recent activity. That’s true even if the methane was generated millions to billions of years ago and remained trapped in sub-surface reservoirs until now. On Earth, 95 percent of all the methane in the atmosphere was produced by biological processes. The concentration is about 18 parts per billion by volume, or ppbv, meaning that out of every one billion molecules, 1,800 are methane. 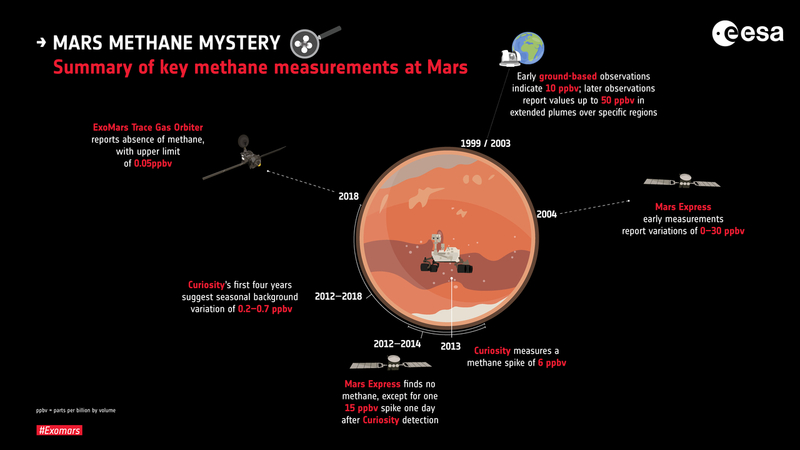 Previous methane detections in the martian atmosphere have been difficult to interpret. 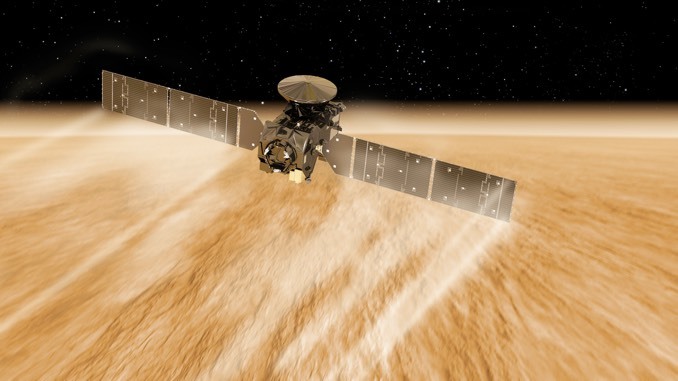 ESA’s Mars Express orbiter found levels as high as 10 ppbv while Earth-based instruments captured transient events with readings as high as 45 ppbv. Data from NASA’s Curiosity Mars rover suggests background levels that vary with the martian seasons between about 0.2 and 0.7 ppbv. The new results from TGO indicate an upper limit of just 0.05 ppbv, or 10 to 100 times less methane than all previous detections. That still means up to 500 tons of methane is present, but it is distributed through the entire martian atmosphere. “We can only report a modest upper limit that suggests a global absence of methane,” said ACS principal investigator Oleg Korablev from the Space Research Institute at the Russian Academy of Sciences, Moscow. 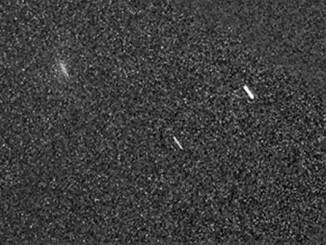 An animation of comet C/2013 A1 Siding Spring captured by NASA’s Curiosity Mars rover as the comet passed near the red planet. On 31 March at 4am BST, Mars passes just 3.1 degrees south of the Pleiades, or Seven Sisters open star cluster in the constellation of Taurus. The Red Planet sets before midnight as seen from the UK, so you should look to the west as darkness falls. 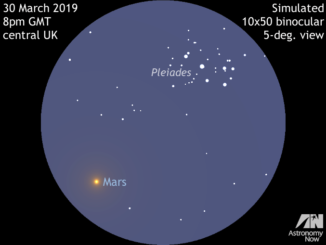 Mars and the Pleiades lie within the same field of view of typical 10×50 binoculars from 28 March through 1 April 2019.